Are you starting back to school? Going to college? I know that college can be super expensive. I always remember the books being ridiculously expensive! It would have been great to have rented them when I was in college. It would have saved so much money! Haven’t purchased your books yet? You can win $100 in Campus Book Rentals to help with the costs. Already bought your books? You can win $100 in PayPal cash to help with your expenses! How great is that? 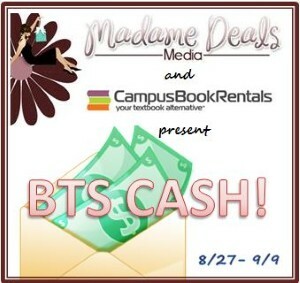 Madame Deals Media and Campus Book Rentals have teamed up to provide this great giveaway event! Winner can choose either $100 PayPal or $100 towards text book rental from Campus Book Rentals! Campus Book Rentals offers new and gently used textbooks for typically less than half the price or more than you’ll pay in your school bookstore. Search for the college books you need and start saving money today! For example, this Calculus book sells for $179.91 on Amazon. You can rent it from Campus Book Rentals for only $64.44. Crazy good savings! Campus Book Rentals is also teamed up with Operation Smile. Operation Smile is an out of this world, awesome organization, that performs life changing cleft lip surgeries on children whose families could not otherwise afford it. A portion of every sale goes to support this program and pay for these life-changing surgeries. Check out Campus Book Rentals and see how much you can save, and help them Pay if Forward to Operation Smile. Giveaway will run August 27, 2012 at 12:01 am EST and run through September 9, 2012 at 11:59 pm EST.